The AzBox miniMe American Edition is a DVB-S2 compliant satellite receiver which supports a wide variety of broadcast formats including exclusive support for MPEG2 4.2.2 which provides studio quality video and and is the most sought after feature of true FTA satellite enthusiasts. It includes a fully featured media center where you can easily playback any video or audio files such as XviD, MP2, MP3, MP4 and MKV files. View your collection of photos directly on your TV either one by one or as a slide show and listen to over 2500 radio stations from across North America! Configure your system efficiently by enabling only the satellites you wish to receive from the included current North American satellite list, quickly find new channels or wild feeds thanks to the powerful blind search function and receive those weak feeds thanks to the sensitive AVL6211 tuner. The Blind Scan function lets you scan all frequencies in a customizable frequency range in order to scan currently active transponders on a specific satellite. Discover new channels and find exciting wild feeds thanks to the powerful blinscan function on the AzBox miniMe American Edition that works with all LNB/F types commonly used in North America including C-band and standard 10750 Ku-band! 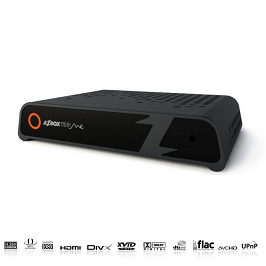 The AzBox miniMe American Edition HD satellite receiver features high quality image resolution even with SD channels as it can upscale the resolution to either 720p, 1080i or 1080p resolutions. Unlike most receivers designed for the European market, NTSC video mode is set as the default, even after a factory reset! You can create personalized lists of favorite channels for easier navigation and sort your channels in several ways such as by satellite or provider. Provider lists are automatically generated when scanning transponders in order to allow easy organization of your channels with minimal effort. The AzBox miniMe American Edition is also a Media Player with full functionality for media of our modern days. Music, Photos and Video are easily played and accessed which allows you to play your favorite music, view your photos and watch your movies. You can also play many advanced and High Quality Audio and Video formats such as XVID, MKV and AC3. The AZBox miniMe American Edition also features an Internet radio player capable of playing your favourite radio station live on your TV with access to over 2500 stations from across North America. With the AzBox miniMe American Edition, it is possible to easily watch YouTube videos right on your TV! No need to use a web browser as you simply have to set your preferences in the categories menu and you are ready to enjoy the wonders of YouTube full screen in High Definition on your TV! The AzBox miniMe American Edition is capable of reproducing High Definition content in 1080p resolution. With this format, you can enjoy the highest quality content in the comfort of your home. Watching TV will become a totally new experience with a crystal clear image, as if it were happening in front of you. Standard definition content is also up scaled to 1080p resolution for maximum picture clarity with today's modern televisions. The Electronic Program Guide allows you to schedule recordings of your favorite programs for later viewing. You may also schedule timers that will remind you and change the channel automatically for your favorite shows! The AzBox miniMe American Edition can easily be updated either via USB or online when the receiver is connected to the Internet. Future firmware updates will bring many enhancements, new features and enable exclusive access to many live IPTV channels along with streaming video clips from a variety of sources. Thanks to your AzBox miniMe American Edition, you will not lose any critical scenes of your favorite show if you need to leave the room. By simply activating the Time Shift function, your program is paused and can be later resumed at your convenience from that exact moment on. You may also record shows either manually or by scheduling a recording ahead of time. With the AzBox miniMe American Edition, you have time on your hands! The AzBox miniMe American Edition includes a File Browser which allows you to browse files not only from local drives attached to the unit but any shared folders on your network as well. Your shared media can be played directly from a shared folder or NAS device on your network! Enjoy the convenience of using wired or even wireless networks by installing the optional USB wireless adapter in order to access your shared media files. Even with its small size, the AzBox miniMe American Edition is equipped with a high level of connection options: 2 USB 2.0 connectors that allow users to connect portable media devices, an eSATA port for maximum performance when connecting an external USB HDD, HDMI (High-Definition Multimedia Interface) output to enjoy the best picture and audio quality in Full HD 1080p, digital optical audio output, Composite video (YPBPR) and Composite video/audio via 1/8 inch headphone to RCA breakout cables. The AzBox miniMe American Edition features anti-clone technology provided by the SecureDongle X software protection dongle from SecureMetric which comes installed inside the unit. SecureMetric is a world leader in the digital security industry and the dongle acts as a digital key in order to prevent the unit from being cloned ensuring continued software development support for years to come. Purchase this product today from one of our authorized dealers.